I’ve been coming to Hanson Chiropractic off and on for a few years. Originally it was for a lower back injury that made putting my socks and shoes on the worst part of my day. A specialist told me my only option was surgery after looking at my MRI. Dr. Hanson’s office thought that was a huge overreaction and they were right. 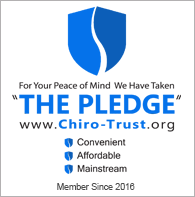 I went conservatively with chiropractic care and decompression therapy and I made a 100% recovery. I continue coming to the office now for an occasional tune up.